This IBM Redbooks publication will provide you with the information you require to understand what is a Parallel Sysplex. With an understanding of the basics, it then goes on to describe how these components are used to enable the two fundamental capabilities of Parallel Sysplex: namely, the ability to concurrently update a database from two or more database managers (thereby removing single points of failure), and dynamic workload balancing. The book then moves on to discuss how the Parallel Sysplex-exploiting products enable you to start delivering continuous application availability, a growing requirement or most IBM System z clients. Typical client workloads are discussed, and their exploitation of Parallel Sysplex is described in clear terms. 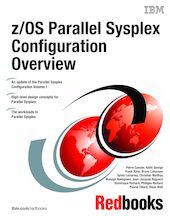 This book is an excellent starting point for those involved in designing and configuring a Parallel Sysplex. It should also be used by those that already have a Parallel Sysplex when further exploitation is being considered. The book refers throughout to other relevant publications that cover specific areas in more detail. This book is an update to the first volume of a previous set of three Parallel Sysplex Configuration IBM Redbooks. Most of the information in the second and third volumes is either available elsewhere, or else it is no longer required.